What is Unique about Belgian Chocolate ? When it comes to chocolates, there are the everyday candy bars we consume every day, the more exotic Godiva or Ghirardelli-style chocolates found in coffee houses and specialty stores, and then there is Belgian chocolate. 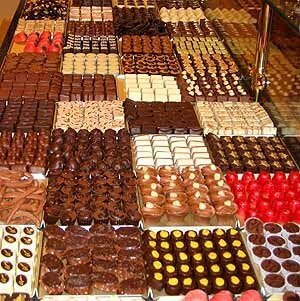 Belgian chocolate is considered to be the gourmet standard by which all other chocolate confections are measured. Even the Swiss, known for their own high quality chocolate, imported the basic recipe from French and Belgian chocolatiers. What makes Belgian chocolate unique is the quality of ingredients and an almost fanatical adherence to Old World manufacturing techniques. Even in today’s world of automation and mass production, most Belgian chocolate is still made by hand in small shops using original equipment. In fact, these small chocolate outlets are a popular draw for tourists visiting Belgiumtoday. Much like wineries, tours of Belgian chocolate shops include tastings and exclusive souvenirs. Belgian chocolate itself has been popular since the 18th century, but a new process created by Jean Neuhaus in 1912 increased its popularity ten-fold. Neuhaus used a special version ofchocolate called “couverteur” as a cold shell for what he called ‘pralines‘. These pralines are not the same as the sugary treats offered in American candy shops. Belgian chocolate pralines could be filled with a variety of flavored nougats or creams, such as coffee, hazelnut, fruit or morechocolate. Few other chocolatiers in Neuhaus’ day could duplicate the complex flavors of his pralines. Many of the Belgian chocolate praline companies are still in operation today- Leonidas, Neuhaus, Godiva and Nirvana are famous for their gourmet pralines. One technical advantage Belgian chocolate has over other chocolatiers is the storage of couverteur before use. In the chocolate making process, the cocoa beans are ground and mixed with sugar and cocoa butter and then smoothed out through tempering (careful addition of heat). Most chocolate companies receive their chocolate in solid form, which means it must be reheated in order to be usable. Belgian chocolate companies often receive their couverteur in heated tanker trucks soon after the tempering process. Because the chocolate has not cooled, it retains much more of the aroma than the cooled varieties. Belgian chocolate may be expensive, but those who have sampled it say that there is no comparison between a standard chocolate bar and a Belgian praline. As a gift or special indulgence, Belgian chocolate is one product which lives up to its reputation for quality. Just to have an idea , Godiva is the most famous brand of Belgian Chocolate in the world and the company has more than 75 years being the the first Chocolatier to create the High Quality Chocolate concept . One kilo of Godiva Chocolate can be sold for more than 250 euros ! !